"Our library is very heavily used," said director Judith Nadler. "The digital and the print-based will continue to coexist. We don't want the electronic instead of the book. We want the electronic and the book." * The New York Observer has taken on the ambitious task of picking the Brooklyn Literary 100: the most important figures in the Brooklyn literary community, including authors, publishers, editors, etc. (What I like about the map is that it also points out the bookish places in Brooklyn, including bookstores and coffee shops). It's obviously a tad arbitrary, but not enough so for New York Magazine, which has taken the Observer's list and edited it down to the top 50, 25, and ultimately 1. And next week, PEN launches its amazing annual World Voices Festival, with six days of incredible readings, films, discussions, etc. by writers from all over the world. McNally Robinson will be selling books at some of these events, so if you're local, peruse the schedule and make plans to attend one or two. * And finally, another item just for locals. Below is the email we sent to over 50 indie booksellers in the city; if you didn't get yours, consider this your official invitation. All of the city's indie booksellers in a room -- what an exciting possibility! As independent booksellers in the five boroughs of New York City, we face unique challenges, as well as unique opportunities. Though you may sometimes feel isolated in your struggle to compete with online book sales, chain stores, and New York rents, there are over 75 other independent bookstores in our city facing the same problems, and finding new solutions. We think we have something to offer each other as independent bookstores in New York: community, idea sharing, the possibility of making our collective voice heard. How these things might be accomplished, and what other goals we might set and achieve, is up to all of us together. We hope you will join us! We have some specific ideas that we will share, and we look forward to hearing yours too. Please consider sending a representative (or two) from your bookstore to this historic meeting, to help all of us help each other, and ourselves. We did our best to gather emails for as many independent bookshops in the five boroughs as we could. But we know this initial email announcement may not reach everyone, so please help us spread the word, and forward to other booksellers we may have missed, or whom you think may be interested. Let's take the great tradition of bookselling in New York City into the future! We look forward to seeing you on May 21. Just a reminder for the book nerds of New York: in celebration of World Book Day or Book & Lovers Day, today from 5 to 8 is the impromptu World Book Party is happening at the southwest corner of Washington Square Park. I'll be working at the bookstore, but if you're free, show up with a book to swap, and make a friend. 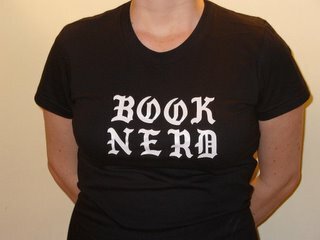 Speaking of book nerds coming together, I'm launching a new little experiment in social networking. I've now joined three book sites: Shelfari, Goodreads, and LibraryThing. If you want to befriend me, you can find me as "booknerdnyc" on all three sites. I've loaded up just the books I've read this year (Shelfari has more, as I've been a member there longer). I'm weighing my impressions of all three sites for a future writeup here. And it's also good practice for me to start keeping better track of what I've read. I plan to seriously start doing some book reviewing around here pretty soon. And I'd also like to get back into chronicling the Brooklyn book community by restarting my Brooklyn Lit Life series. If you have suggestions for folks I should contact for interviews who are somehow involved in the literary life of Brooklyn -- booksellers, publishers, editors, authors, etc. -- or if you are one yourself, zing me an email and we'll get it started. And for one last excercise in community building: thanks to the technological prowess of my buddy Steve, I've created a Book Nerd mailing list, which you can join by clicking at right. I'll be using this as I work toward creating my bookstore to let interested folks know about progress, events, etc. -- and eventually (Lord willing and the creek don't rise, Mom) it will become the bookstore mailing list. Check it out! Enjoy the beautiful spring day, and consider giving a book to someone you love to celebrate. It's a great way to come together. -experience a little bit of sensory overload -- practice for BEA! Despite the always grueling walk to and from the Javitz Center, it was a good day. Being there also reminded me of another cool day coming up: Free Comic Book Day! Saturday, May 3, at a comic shop near you, they'll be handing out grab bags of free issues, so you can read more of your favorites and discover something new. As I mentioned two years ago -- I think bookstores should do this too. What about Galley Giveaway Day? Although many have been shuttered, more than 2,400 independent shops still exist around the country.... Products that aren’t fundamentally made up of ones and zeros — vinyl records, for instance, which have a habit of turning casual fans into collectors — have proved a salvation for many retailers." Full disclosure: I adore Regina Spektor (I bought her first album at indie Rebel Rebel on Bleecker Street), and I totally forgive her for making copies of CDs, just like I totally get all of the struggling artists buying used books online or borrowing them or going to the library. And I admire her for getting clued in to what indie music stores have done for her, just as many authors have done. I think the un-digitizable appeal of vinyl has something to teach us as book purveyors. I think the winnowing down of the indie record store industry, and also its persistence due to its irreplaceable offerings, has a lot of parallels with bookstores. And I think this industry wide day of celebration, education, and showcasing what's great about indie music stores is something we could all learn from. Happy reading -- happy listening! "Following a rise of 4.7% in January, bookstore sales in February surged 11.4% to $1.1 billion from $1 billion in February 2007, according to preliminary estimates from the U.S. Census Bureau. For the year to date, bookstore sales rose 6.7% to $3.4 billion. By comparison, total retail sales in February rose 6.9% to $314.7 billion. For the year to date, total retail sales were up 5.8% to $627.8 billion. Note: under Census Bureau definitions, bookstore sales are of new books and do not include "electronic home shopping, mail-order, or direct sale" or used book sales." On a totally unrelated note... Toby at Three Lives was the first to introduce me to the concept of Book and Lovers Day, April 23 -- the traditional birthdate of both Cervantes and Shakespeare, and the feast day of St. George, which is celebrated with gifts of books and flowers in Barcelona. Some bookstores (notably Tattered Cover) have embraced this bookish sort-of-holiday with flower giveaways with book purchases, and the date has also been codified as World Book and Copyright Day or just World Book Day. WORLD BOOK PARTY, Wednesday, April 23, 5-8 pm, Washington Square Park. No readings by famous authors. No corporate sponsorship. No mega-stores making a buck. No registration or reservations. Just one reader giving a favorite book to another reader. Show up with a book to give to someone. You can coordinate with a friend, and swap books. Or you can bring a book to give someone you don't know. Please pass this along, and reserve April 23, 2008, 5-8 pm for the World Book Party. At the southwest corner of Washington Square Park (corner of Washington Square South and McDougal Street, one block from West 4th Street subway stop). Everyone is welcome---and it's free. So, if you're in New York, mark your calendars for a truly Quixotic book experience. Anyone know of any other plans to celebrate World Book Day? For some combination of reasons, I'm having a week where I can't get anything done. There's so much to do that it's induced a kind of paralysis manifested in sleeping late, watching DVDs, and obsessively/apathetically web surfing, as opposed to blogging or writing or acting on the one million future bookstore items on my to-do list. My apologies for a psychic profile that's the equivalent of a blank stare at the moment. My only thought is that maybe I need a bit of down time, and nothing is going to break if I drop out for a couple of days. Hopefully I'll be up to speed next week. In the meantime, look at this, and find a copy of this -- enough beauty and complexity to keep even the blank-minded enthralled. The ALP and I rarely read the same books. This is both practical (because we talk about everything we read, it's like reading twice as much) and a matter of taste (mine tend toward mainstream-ish literary fiction, his toward the weirder ends of the spectrum, from tales of con men to experimental novels to mass-market horror. Go fig.) But there is occasionally some overlap, often with books that fit into more than one category. One recent example was Toby Barlow's werewolf-novel-in-free-verse, Sharp Teeth. (Check out the very cool animations on the book's website -- props to HarperCollins for a job well done). We were both intrigued. My enthusiasm for the book led to a paragraph-long staff pick. The ALP was inspired to write an exploration of experimentation in genre fiction using metaphors from evolutionary theory. I kid you not. And it's good reading. What's your relationship to books and your loved ones? All the same books, all different, or the same books with different takes?